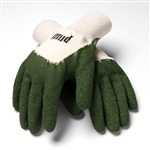 Great for working in dirt, mud and anything wet or slimy. Excellent for weeding, picking up yard debris. 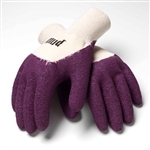 Provide a good grip on tools, wood, boxes and glass. Made of 100% cotton fabric coated with green latex rubber. Machine washable. Available in Small, Medium, and Large.